Perfectly Created Chaos! : "Best Yet"
Today I am sharing my card for yesterday's Tuesday Morning Sketches Challenge. The image I used is a digital image from Guylou's Inimitability I copied it into Microsoft Word and then resized it so that I knew it would fit into the Label One Nestability that I wanted to use. I printed it out and let the image dry while I worked on the rest of the card. I started with a 4 1/4 x 11 piece of Ocean Tide from PTI. I added a layer of Mostly Mustard that I embossed using the cuttlebug argyle embossing folder. I cut the Ruby Red piece using Label One Nestabilities. I colored the image using Copics: Y21,Y26,E07 (flowers) G24 (leaves) BG72, BG75 (Basket), G21, G24, E07, E09 (Apples). After I colored it in, I sponged the top with Soft Sky ink and then used my applicator to sponge on Weathered Wood and Tea Dye distress inks around the top and bottom. I also edged the bottom in "Vintage Photo" and also did the top with Weathered Wood again. I didn't have time do any crafting this morning, so I probably won't be back again until Friday. Until then, enjoy your crafting time! Oh my, your card is wonderful! Thanks for joining us at Tuesday Morning Sketches. 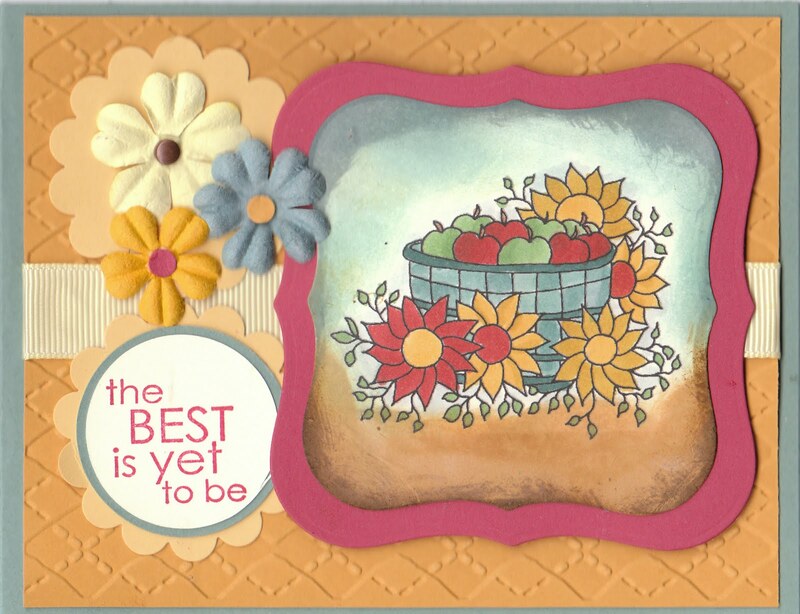 What a lovely card, and just perfect for the In the Garden challenge at MTTC this week. Great card! Thanks so much for playing with us at Daisy Doodles! Beautiful!!! Love the way you coloured the image! Thanks for using a Guylou's Inimitability Digistamp!